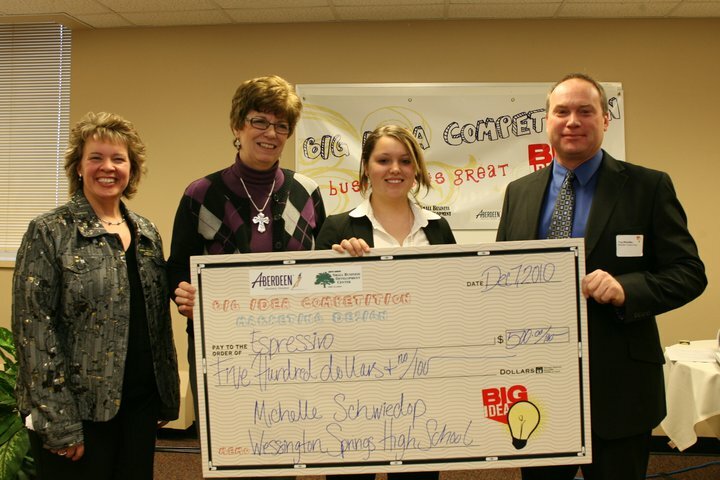 Wessington Springs Student Wins Competition | McQuillen Creative Group, Inc.
We were pleased to award Michelle Scwiedop of Wessington Springs High School with a check for $500 for her winning entry in the 2010 Big Idea Business competition. Each year the Small Business Development Center hosts this competition open to Northeast South Dakota high school students. The objective is to get kids thinking about how to go about fostering an idea into a business strategy. They don’t actually pursue the business as part of the competition, they submit written applications as their entry. McQuillen Creative had been creating the advertising content for the competition as well as the complex website which allows the students to submit their entry. The website also contains a backend which allows teachers and judges to evaluate the work submitted. After experiencing the event in it’s inaugural year of 2007, Troy McQuillen, (me) proposed the idea of offering a marketing component to the contest. I always encourage startups to think about their marketing and image as early as possible in the business development stages. I felt the kids would appreciate an opportunity to put a logo to their idea then produce a single page ad. The students must submit a Big Idea entry before they can be eligible for the marketing contest component. This year we received over 40 applications just for the marketing component. Michelle won because she did an excellent job of meeting all the criteria for the contest, and she created a very thorough ad. Another student from Wessington Springs came in second place. The Big Idea contest is made possible with endless hours by SBDC‘s Kelly Weaver and generous support from Absolutely! Aberdeen.